I’ve talked and recommended this foundation on many occasions, but I don’t actually have a post dedicated to it. It’s been requested on a few occasions, and since I’ve been wearing it almost every day lately, it’s reminded me of how much I love this foundation and figured it’d be the perfect time for a review on it! My love for this foundation dated back six years ago when I was in the market for a full coverage foundation. I was recommended Estee Lauder Double Wear and haven’t looked back! This miracle in a bottle claims to provide flawless, lasting coverage that will withstand heat, humidity and sweat while feeling lightweight on the skin and looking completely natural throughout the day. It’s also smudge-proof, oil-free, Non-acnegenic and fragrance free. There are 21 shades in total, and the shades are broken up into three categories, making it easier to find the right shade for your undertone. *As a side note, neutral in the Estee Lauder Double Wear line refers to peach. *Warm = red, yellow undertones, Cool = pink/rosy undertones. When I have no tan (MAC NC15-20 coloring) I use shade 1W1 Bone. When I’m tan (MAC NC35-NC40 coloring) I use 3W1 Tawny. Tawny is slightly light when I’m NC40, but the next shade up (Shell Beige) lacks enough yellow. Here’s a comparison photo of 1W1 Bone with MAC Studio Fix Fluid in NC15 and 3W1 Tawny with MAC Studio Fix Fluid in NC40. Can you tell the difference? They’re incredibly similar. 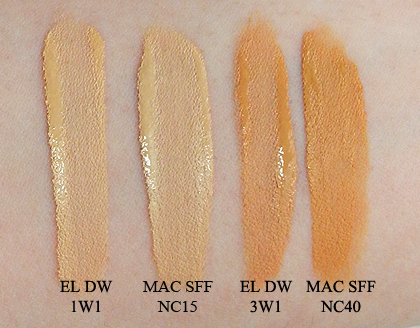 The only noteable differences is that 1W1 Bone is slightly darker than MAC Studio Fix Fluid in NC15 and Studio Fix Fluid in NC40 is slightly darker and more yellow than 3W1 Tawny. It’s pretty crucial to find the right color match with this foundation because of the opaque coverage. Sheer foundations are usually more forgiving, but with full coverage foundations, to avoid looking like you’re wearing a “mask” of makeup, you really need to take the time at your local counter in finding the closest shade to match your skintone. If I’m looking for a very full coverage, I’ll opt for a standard paddle foundation brush. But on most days, I like using a duo-fiber/stippling brush for a less opaque, yet still flawless look. For a lighter coverage, a dampened beauty blender sponge is said to work very well. This foundation dries quickly once applied to the face, but it’s not difficult to work with when dry. I find that it layers well (although I’m always good with one layer) without looking blotchy. Once the foundation has set, your skin should feel dry to the touch. If you find this difficult to work with, applying a moisturizing base prior to the foundation can help. It provides medium to full coverage. 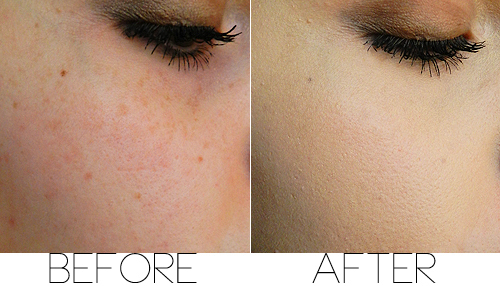 With one layer it covers just about everything, including light sun spots and blemishes. In the below (left) photo, I wanted to display how opaque the foundation is with a couple swipes of a standard foundation brush. 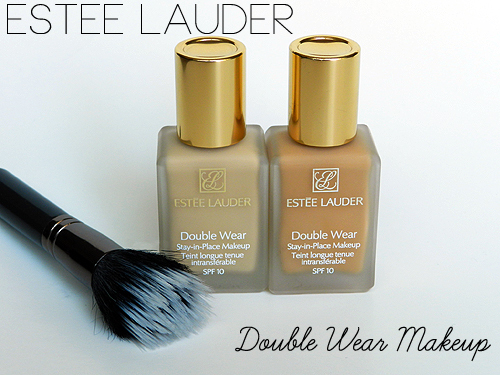 Estee Lauder Double Wear has a semi-matte, soft-focus finish that doesn’t look dull. I rarely ever have to set with a powder and my skin barely gets any shine throughout the day (my skin type is very normal). It holds up incredibly well throughout the day. From morning till the time I go to sleep, my foundation is still in place. Now that I’ve said everything good to say about Double Wear, here are the draw backs. I have tried and owned several foundations. Some photograph well, and some don’t (usually due to the Titanium Oxide in the ingredient list). This one is probably one of the worst. For photos outdoors in natural light, it isn’t too bad. But for indoor photos and flash photography, it really washes me out and sometimes gives my skin a grey-ish cast. If I look back at old photos and my face is white and my neck is tan, I know that I wearing Double Wear. This is an absolute fabulous foundation, but avoid it if you’re going to be photographed. Lastly, because this foundation is water resistant, some may find that it’s difficult to remove. A cleanser containing oil works best (or you can add a drop of any oil to your cleanser – olive oil, jojoba oil, baby oil, etc.) My favorite makeup remover wipes; Neutrogena Makeup Remover Cleaning Towelettes work perfectly. Overall, the pros outweigh the cons, which is why I’ve continued re-purchasing this foundation again and again throughout the past few years. Price: $35, at your local department store that carries Estee Lauder. PROS: This foundation lives up to all of it’s claims (in my experience at least). It provides medium to full coverage that looks natural when it’s not over-applied, it endures heat and sweat like a champion and doesn’t transfer as easy as most of my other foundations. It also stays in tact till the moment I go to sleep, so it deserves an A+ for lasting power. CONS: The only real cons with this foundation is that it doesn’t photograph well (gives a white cast in flash photography). Also, even though there is a good range of shades, the color selection still isn’t all that great. I found that the cool shades are very pink and the neutral shades leaned pretty orange. Also, if you apply too much of this foundation, it can look unnatural (less is more!). PACKAGING: I’m not a fan of the packaging, but I’m not a fan of any of Estee Lauder’s packaging, for the records. It’s pretty simple and standard, which is fine, but because of the pour-bottle design, the top and cap can get very messy. **The MAC Foundation Pump fits on this bottle, so if you use this foundation often and you prefer a pump, it may be something you’d like to look into. You can purchase it separately from MAC for $7. OVERALL: If you can find your color match in this foundation, I won’t doubt that you’re going to love this foundation. I think some are quick to label this foundation as too heavy or too fake, but with any pigmented foundation, you have to take in consideration that you’re not going to need as much product as with a lighter coverage foundation. Start out with less than you think you’re going to need, and build if necessary. Starting out with too much at once will only set yourself up for disaster. This foundation has high rating for all skin types, and it’s especially beneficial for combination oily skin types because of it’s close to matte finish and long-wearing abilities. Step by Step Eyeshadow Tutorial with Dramatic Black Liner and a Darkened Crease. Maybelline SuperStay 14-Hr Lipstick in Please Stay Plum. Great review! Double Wear is my absolute favorite foundation! I agree that it doesn't photograph very well indoors but I think my skin looks flawless under natural lighting in photographs. Thanks for explaining the Tone Chart. I had no idea that what the numbering meant. This is by far my favorite foundation! I'm lucky that I have the exact shade that matches my skintone..great review! I am NC15 and wear Linen, I wonder how much darker that is then Bone. I thought Bone was like white pale, but judging by your swatch it's very close to what my match would be. Hmm..
Natty, I have a foundation question. How many days a week do you wear foundation? I know you have many foundations, but if you had to estimate, how long would you say a bottle of foundation lasts you with daily use? Have you ever tried Doublewear Light? I went to the Estee Lauder counter wanting to try the normal Doublewear for a wedding day foundation, they told me how it didn't photograph well, and recommended the Light version for photography. Do you have an opinion on it? Thanks for this post, I have this foundation in Fresco and I never use it b/c I always thought it was too peachy/orange on me. Now i know why. I think I'll give it another try though and just use very little. Awesome! I agree that it works really good under the eyes, especially since it doesn't budge! I rarely ever wear concealer when I wear Double Wear. Love this foundation, it's awesome and one of my faves. Thanks for the post! Really interesting to read your take on it. My favourite foundation but really heavy ;(. I have in 2N2 Fresco. I think this foundie lived up to its hype! I finally caved in and drove all the way to Old Orchard and got me a sample. I even had a sweet SA color match me and surprisingly she showed me that I was a perfect 2N1 Desert Beige. I never thought I would be a Neutral since I'm an NC20 with no tan, but was always told I have strong yellow undertones (Half Italian roots). The SA also told me that since it is SO full coverage the warm shades can look way too yellow and make you look sallow if you are pale. Are your sure your the right shade too? I wanted to love this! It was the perfect color match, I was match to Tawny and usually use NC35.However it made me brake out, sad because I really liked the coverage. Hi , you should try the new benefit hello flawless oxygen wow. I am absolutely in love with this stuff. My skin is an nc37/40 sometimes nc35 in winter and the color match is spectacular. I got the beige color. The texture is similar to vitalumiere aqua but better, it is more flawless , and it lasts more in the skin if you set it with MUFE HD powder. I could say it has more coverage if applied with fluffy brush. This is my new HG. Of course we cannot compare the coverage with ELDW. Since I noticed we have very similar skin and taste for foundations I though I could give you this hint. I've read a lot about this foundation but i've yet to try it. I'm definitely curious as to whether or not they have my shade now! After I finish my favorite at the moment (smashbox studio skin) and what I just ordered which is the Lancome ultra 24 hr. I'd really get this one in Tawny. Hope it will be a good match for my nc30-35. great reviews !! thanks a lot !! I have to admit I tried this foundation and absolutely detested it. It made my face look strange and “made up” and it seemed to come off on everything. I've moved onto MAC Tinted Moisturizer and am also using Laura Mercier TM. I'm much happier with either of them, though I probably like the LM better. 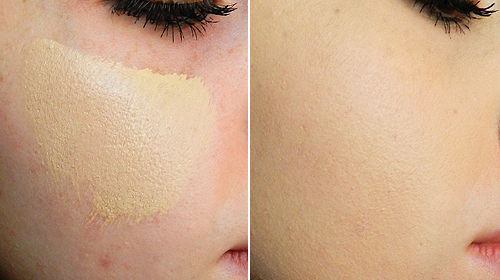 Since it's a full coverage foundation, it can definitively give you the very made up look. If you're using a tinted moisturizer, you probably don't need as much coverage as EL DW provides. If you still have the bottle, try applying your favorite moisturizer all of your face so your skin is slightly damp. Then apply a dot of the foundation on each of your cheeks, chin and forehead. Blend with a flat top brush and your face will look flawless without the cakiness. I agree LM is an amazing TM! On the Temptalia Foundation Matrix the match for NC25 is either Sand or Desert Beige. Sand might be a touch too light though. It seems there isn't a perfect match. I use MAC NC40 is it going to match if I use Estee lauder 4W1 Shell beige? 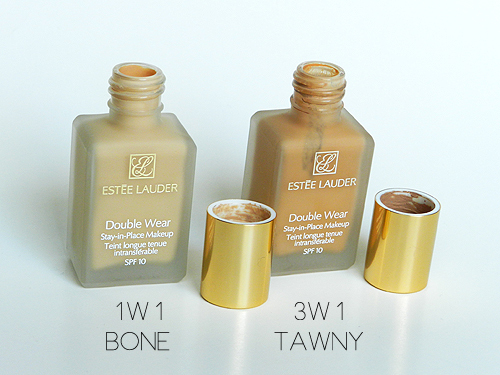 I was sooo impressed with the Estee Lauder Double Wear! Seriously it's been amazing for me. I've got oily skin, but it just stayed put all day, but it didn't look unnatural or 'caked on'. I'll be reviewing the Estee Lauder Double Wear Light soon too! Heya i'm for the first time here. I came across this board and I in finding It truly useful & it helped me out a lot. I am hoping to provide something back and aid others like you aided me. nowadays. I honestly appreciate people like you! Take care! I have been using 4C1 Suede for years and found out last night at the Belk counter they have revamped their line of Double Wear and no longer carry this shade 😦 What am I going to do? Help! Double Wear Linen is discontinued, gone, no where to be found…. I have worn it for years, and it is perfect for my hard-to-match complexion. I bought a bottle of Ecru at the Nordstrom counter as an emergency backup, and don't really like the color or the new feel. Any suggestions for a new long-lasting, full-coverage foundation in a similar shade? 1W2Linen? Doesn't have to be Estee Lauder. Thanks so much. I used to work at the EL counter when I was in college, and loved the DW Foundation…I had to mix two colors together to make my color though. I have since moved onto MAC Studio Fix compact just out of laziness. I may need to revisit the EL counter. I did like it a lot. I love this foundation but it is so hard to get out of my brushes. Does anyone have any suggestions? I really like the formula as it covers my acne scars and I can even use it around my eyes to disguise some of my dark circles!! I thought I was shade 2n2 Fresco, but that leaves a grey tone to my skin. The assistant matched me up to Tawny which was too dark for me! I tried a sample of Rattan which I thought would be a good match but my sister told me I looked ornage. I'm really wanting to try Dawn 2W1, one of the new shades but they never seem to have it?! For now I stick to mixing fresco and rattan with a sample of ivory maybelline foundation…. The after photos look great. Is it true that this product withstands sweat? It looks like it can create 'caking' though when put on too much.